London: Parliament House (designs for). Plan showing two double seven-bay porticoes with steps opening into a circular hall with on either side two larger circular courts, each with a central fountain and a small portico at the end. You are here: CollectionsOnline / London: Parliament House (designs for). Plan showing two double seven-bay porticoes with steps opening into a circular hall with on either side two larger circular courts, each with a central fountain and a small portico at the end. Drawing in pencil of part of a plan for a portico. 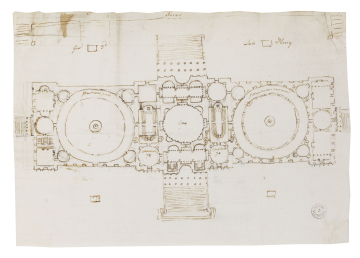 This plan follows from that in Adam vol.7/2, with the introduction of two large circular courts for 'Illustrous' peers and commons, adjoining James Adam's proposed new chambers for each. The lateral porticoes in Adam vol.7/2 have been scaled down and theother two increased in importance. This drawing and the related elevation in Adam vol.7/4 probably belong to late 1760, that is if they were drawn in Italy. The inscribed notes 'Geo. 3d' and 'Late King' establish the date of the drawing after October 1760, George III's accession.